Today we have part one of a guest post written by David Herzberg, Ph.D., who will present “The Other Drug War: Prescription Drug Abuse and Race in 20th-Century America” on Tuesday, October 22. Read part two here and and part three here. It’s a historian’s nightmare: librarians spent the better part of a century diligently cutting out and throwing away some of the most important parts of the journals they received each week before binding and shelving them. Precious historic material—capstone work by some of the nation’s brightest and most creative minds—was destroyed by the very people devoted to preserving it, and destroyed only more thoroughly because of those peoples’ good intentions and zealous work ethic. Why would they have done such a terrible thing? This is no hilariously nerdy horror movie. It really did happen all across America for most of the 20th century. As far as I can tell, the New York Academy of Medicine stood almost alone in deciding—who knows why—not to rip out the advertisements in their medical journals. We owe them sincere thanks for this. 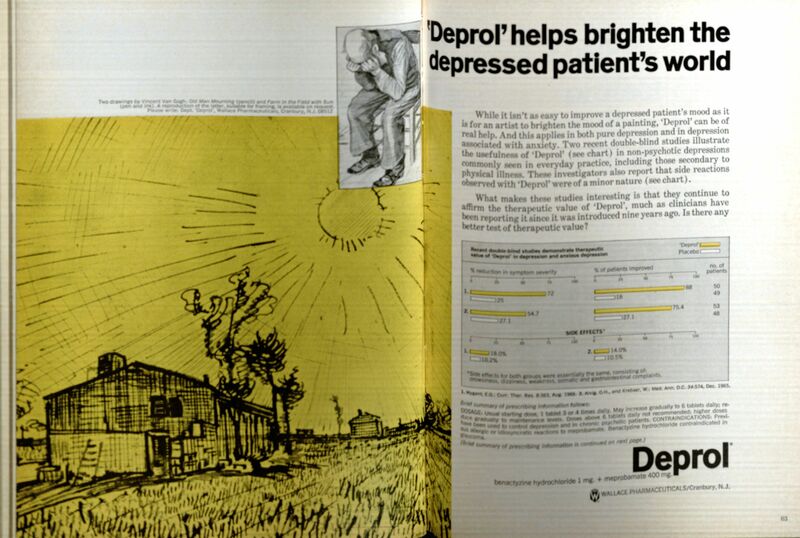 “‘Deprol helps brighten the depressed patient’s world.” From JAMA, volume 204, number 4 (April 22, 1968). Click to enlarge. It’s pretty clear why most librarians cut out the ads, and it wasn’t just to preserve space on their shelves. Back in the day, the medical profession prided itself on being insulated from crass commercialism, and major journals like the Journal of the American Medical Association not only insisted on approving each advertisement, it also lumped together all the ads in an easily removable bunch before and after the main body of the journal. Ads were thus clearly identifiable as separate and unrelated to the pristine knowledge housed in the journal’s interior. Why would a good medical librarian save them? We all know what happened next. Sometime during the consumer culture revolution of the 1950s, when commerce stopped being crass and instead became a beacon of liberty in the fight against communism and a practical organizing principle of most American institutions, consultants advised the American Medical Association to embrace journal advertising. Ads began to proliferate, and they became bigger, more colorful, and ever more dependent on emotionally charged images to convey the kinds of before-and-after miracles of Madison Avenue. Then, one day, they broke out of their quarantine and began to appear in between articles throughout the journal. Advertising became so ubiquitous, and so important, that a separate “Index of Advertisers” was provided in the back of JAMA to help readers locate the ads just like the table of context helped them locate the articles. In a sense, the ads became a shadow journal alongside the articles, providing more digestible (and typically more optimistic) reports from the cutting edge of medicine. 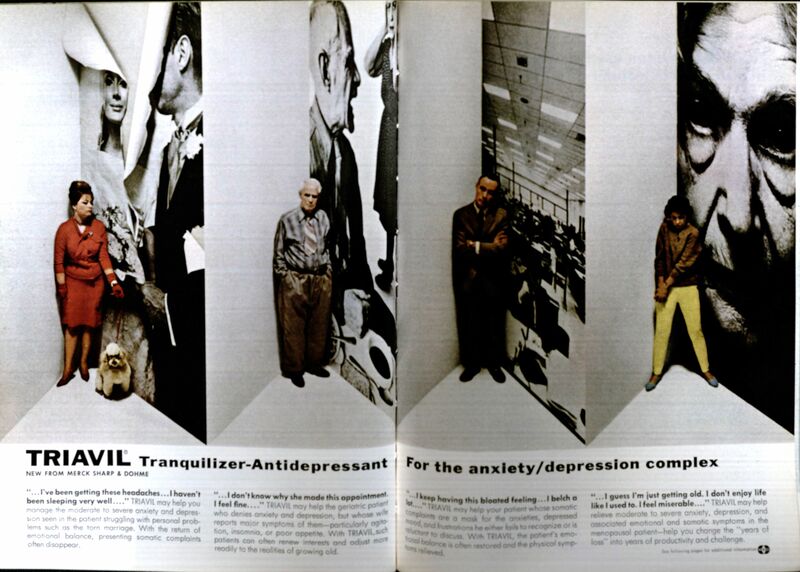 Triavil: Tranquilizer-antidepressant for the anxiety/depression complex.” From JAMA volume 194, number 8 (November 22, 1965). Click to enlarge. It was only a matter of time until ads became so thoroughly enmeshed that it was no longer possible to cut them out without also removing parts of articles. Librarians continued to try, however: as late as the 1970s and 1980s, they diligently sized up each page and sliced out whatever advertising they could. Those decades are especially frustrating for historians, if you ask me. We can see the appetite-whetting first and last page of, say, an eight-page mega-advertisement on Valium and “the modern man,” but the meat of the sandwich was long ago pilfered. This entry was posted in Collections, Events, History of medicine and tagged ads, advertisements, guest post, medical journals, medical libraries, Shadow Journals by nyamhistofmed. Bookmark the permalink. Another big problem is the lack of cover-to-cover coverage in online journals. Often (usually? ), the ads are missing from these as well.